many disappointments; there are no miracles." The story of penicillin continues to unfold. Authors have written any number of books and articles on the subject, and while most begin with Sir Alexander Fleming's discovery in 1928 and end with Sir Howard Florey's introduction of penicillin into clinical medicine in 1941 or John C. Sheehan's inorganic synthesis in 1957, broad differences of opinion exist between and among the principal scientists, governments, laboratories, and drug industries in Britain and the United States as to the details of this story. Over and above the microbiological and chemical achievements in penicillin's discovery are to be found aspects of competition between two nations and their scientists; political and wartime intrigue; competition for academic and financial rewards; the formidable challenge of producing penicillin in quantities needed to support the military in World War II; the complexities of cooperation among governmental, industrial, and academic entities; and human, legal, and national differences over patent rights and royalties in the postwar years. Despite these issues, the story of penicillin is one of scientific, medical, and industrial triumph that made heroes and saviors of the men and women who were associated with its development and use. Furthermore, no other chemotherapeutic agent did more to raise the professional status of the doctor in Western medicine. Molds are kinds of plants, but they are like mushrooms and toadstools rather than like the grasses and garden plants. They are fungi. The main difference is that they do not produce seeds in little pods like peas and beans but instead release "spores," tiny dust-like particles too small to be seen by the naked eye. These float away from the parent molds, or fungi, until they find something suitable on which to grow. 1929, Vol. X, p. 226. USE IN THE ISOLATION OF B. INFLUENZAE. From the Laboratories of the Inoculation Department, St. Mary's Hospital, London. Received for publication May 10, 1929. WHILE working with staphylococcus variants a number of culture-plates were set aside on the laboratory bench and examined from time to time. In the examinations these plates were necessarily exposed to the air and they became contaminated with various micro-organisms. It was noticed that around a large colony of a contaminating mould the staphylococcus colonies became transparent and were obviously undergoing lysis (see Fig. 1). Subcultures of this mould were made and experiments conducted with a view to ascertaining something of the properties of the bacteriolytic substance which had evidently been formed in the mould culture and which had diffused into the surrounding medium. It was found that broth in which the mould had been grown at room temperature for one or two weeks had acquired marked inhibitory, bactericidal and bacteriolytic properties to many of the more common pathogenic bacteria. The colony appears as a white fluffy mass which rapidly increases in size and after a few days sporulates, the centre becoming dark green and later in old cultures darkens to almost black. In four or five days a bright yellow colour is produced which diffuses into the medium. In certain conditions a reddish colour can be observed in the growth. In broth the mould grows on the surface as a white fluffy growth, changing in a few days to a dark green felted mass. The broth becomes bright yellow and this yellow pigment is not extracted by CHCI3. The reaction of the broth becomes markedly alkaline, the pH varying from 8-5 to 9. Acid is produced in three or four days in glucose and saccharose broth. There is no acid production in 7 days in lactose, mannite or dulcite broth. Growth is slow at 37°C. and is most rapid about 20°C. No growth is observed under anaerobic conditions. In its morphology this organism is a penicillium and in all its characters it most closely resembles P. rubrum. Biourge (1923) states that he has never found P. rubrum in nature and that it is an "animal de laboratoire." This penicillium is not uncommon in the air of the laboratory. IS THE ANTIBACTEBIAL BODY ELABORATED IN CULTURE BY ALL MOULDS ? We often see this green growth on jam, bread, and on fruit. If eaten, it is easy to detect and unpleasant to the palate. One of these molds has for nearly sixty years saved the lives of many millions of sick and wounded. It is called penicillin, and it grows in the shape of a tube or a pencil, hence its name. The man we have to thank for this is Dr. Alexander Fleming, a bacteriologist who worked in St. Mary's Hospital in London. Bacteriologists are scientists who study germs or bacteria. They grow them on glass-lidded dishes called culture plates or Petri dishes. In 1928, Fleming was growing staphylococci, a round-shaped bacteria, injurious to man. To study this under a microscope he had to remove the lids. Leaving one uncovered enabled the airborne spores from a mold called Penicillium to settle in it and form a large colony, which then spread out in a circle and set about dissolving the staphylococci. This unexpected event led Fleming to investigate the mold that had so effectively attacked the bacteria. With the help of mycologists, it was named Penicillium rubrum, but later it was correctly identified as Penicillium notatum. Fleming put spores from this mold onto another plate, where they were allowed to grow for four or five days. Various bacteria were then added to the plate, some of which grew until they touched the penicillin mold and then stopped. Other bacteria would not even go near it. Scientists established that this mold was an antibacterial material—an antibiotic—a microorganism capable of killing another microorganism. Nobody else seemed impressed with these findings except Professor Harold Rainstrick of the London School of Hygiene and Tropical Medicine, who attempted to produce larger quantities of penicillin from 1929 to 1932. He was unsuccessful in getting other scientists interested in a common mold as a medicinal tool, and with the discovery of life-saving sulfonamide—sulfur drugs—in 1935, interest in other germ-killers waned. As a laboratory scientist rather than a clinician, Fleming did not use his penicillin to kill infections in humans. 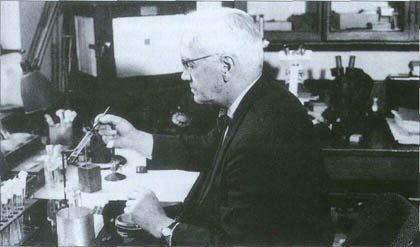 Moreover, ten years after Fleming's discovery, penicillin's chemical structure was still unknown, and the substance was not available in sufficient amounts for medical research. In fact, few scientists thought it had much of a future. But the outbreak of World War II changed that thinking by raising the treatment of battlefield wounds and disease from one of academic research to that of a national priority. in the Isolation of B. Influenzas"
In the years leading up to the discovery and clinical use of penicillin, medical science had been successful in identifying and generally classifying most of the major contagious diseases. There were also advances with vaccines, serums, and the diphtheria anti-toxins. Although researchers and doctors knew the names and pathological effect of most diseases, and could observe their morphology, the practicing physician was powerless to combat deep-seated infections. The only recourse for serious bacterial infections was to hope for an immunological response that would overpower the infection. Tragically, for millions each year this never happened. For a brief few years in the early 1930s, scientists thought they had discovered the "magic bullet" in the war against septic infection with the discovery of the sulfonamide derivatives. But the antibacterial powers of the sulfonamides proved disappointing as researchers learned of their ineffectiveness in killing staphylococci and pneumococci. They only stopped those germs from growing. Interestingly historical records and folklore refer to ancient Chinese and primitive peoples successfully treating infections and boils with warm soil and molds scraped from cheeses, and in England, bread poultices were the home remedy for these up until penicillin became available. Unfortunately, no one made the connection. At Oxford University in England, Dr. Howard Florey, Director of the School of Pathology Dr. Ernst B. Chain (who had fled from Hitler's pogrom against the Jews in Germany), Dr. Norman G. Heatley, and Dr. Edward P. Abraham conducted exploratory research on how penicillin could be used to treat infection. Dr. Fleming gave them some of his culture, and they grew more penicillin very carefully and found it indeed had remarkable curative properties. the time, penicillin was in such short supply that the scientists found it necessary to recover the unmetabolized drug from the patient's urine for purifying and recycling into the patient. Part of the frustration that the Oxford group of researchers faced during these years was their difficulty in obtaining research funds to support their work. Money was short and governments and the pharmaceutical industry continued to look to the sulfonamides and their derivatives. The outbreak of World War II in 1939 changed everything and, as it raged through Europe, Asia, and Africa, soldiers and civilians died from ravaging staphylococcal, streptococcal, and pneumococcal infections (Gram-positive micro-organisms). The publication of the Oxford report on the isolation of various types of bacteria with penicillin coincided with the Battle of Britain and the beginning of the air war that raged over the skies of Britain in 1940 and 1941. People injured in air attacks were dying. Doctors wanted more effective methods for treating burns. Penicillin was badly needed, but the daily bombing raids over Britain made its industries and laboratories vulnerable to German bombs. The Rockefeller Foundation in New York arranged for Florey and Heatley to come to America in July 1941 to ask for help in making large quantities of penicillin. They met with Dr. Charles Thorn, the U.S. Department of Agriculture's chief mycologist. Convinced of the drug's potential in treating infection, the U.S. Office of Scientific Research and Development and its Committee on Medical Research agreed to increase the production of naturally fermented penicillin. The Office of Scientific Research sought also to identify the chemical structure of the penicillin molecule and to attempt a chemical or inorganic synthesis. Both projects of production and trying to make a synthetic drug went forward concurrently. By 1941 thirty-nine separate drug laboratories in the United States had embarked on the effort to synthesize inorganic penicillin. This was not the first time that the penicillin-producing strain of Penicillium notatum had reached the mycologists in America. In 1930 some of Fleming's culture had been sent to Thorn to get his confirmation that it was P. notatum and not P. rubrum—the name originally given to it. Thom distributed samples to other mycologists who were interested, but apart from confirming the identity of the mold, nothing was done except some laboratory work by Dr. R.D. Reid, who confirmed and extended Fleming's findings. In December 1941 the Japanese attacked Pearl Harbor in Hawaii, and the United States entered the war. America now urgently needed penicillin to treat its own wounded. What else could be done? The place chosen to produce naturally fermented penicillin was the Northern Regional Research Laboratory at Peoria, Illinois, located in the middle of the greatest corn-growing farmland in the world and therefore very keen to find new industrial uses for surplus farm products, including corn. At the time of Florey and Heatley's visit, the Peoria laboratories were already involved in fermentation research on corn-steep liquid, a by-product of the wet corn-milling industry that produced corn starch. It was the liquid left after the corn kernel was removed from corn during soaking. This lactose liquid became the medium used in the culture of penicillin, and its use increased penicillin production by ten times, making possible the commercial production of the much-needed drug. At first all the penicillin was made from descendants of the original molds that had landed on Fleming's plate in 1928. They had been kept alive in various laboratories in England. However, they varied in their ability to produce strong penicillin, so the American scientists kept looking for better kinds of molds. They were unsuccessful until 1943 when they found that the mold—Penicillium chrysogenum—discovered on ripe cantaloupes by Mary Hunt from Peoria, was much more potent and thus ideal for their needs. Scientists from Britain and the United States continued to cooperate closely, and as Peoria increased production, the valuable drug was made available to Britain and other Allies. companies were reluctant to share information for fear of prosecution under the Sherman antitrust laws. Despite those obstacles, work went forward on the production of natural penicillin with the goal of having ample stocks of the drug available for General Eisenhower's invasion of Europe in the spring of 1944. By D-day, some 300 billion units of penicillin were available to the armed services crossing the channel. In large measure, the success of the Peoria program was due to the efforts of Albert L. Elder, coordinator of the penicillin program of the War Production Board of the U.S. Government and Robert D. Coghill, chief of the fermentation division of the Peoria Laboratory. By the war's end, twenty-one plants were involved in the drug's manufacture. The challenge of mass-producing the drug had been daunting. On March 14,1942, the first patient was successfully treated for strephtococcal septicemia with U.S.-made penicillin. Half of the total supply produced at the time was used on that one patient. By June 1942 there was just enough available to treat ten patients. Penicillin was first tested for military use in the spring of 1943, with pilot studies on soldiers with chronic bacterial infections in Bushnell General Hospital in Utah and Halloran General Hospital in New York. By autumn, doctors were using antibiotic in combat zones, where it was limited to American and Allied military and to patients with life-threatening infections. The first U.S. wounded to directly benefit from the drug were the flight crews of the Eighth Air Force stationed in Britain. Rationing was necessary, as a single infection could require 2 million or more units of the drug (single ampoules—sealed glass vessels holding solutions for hypodermic injection—contained 100,000 units). During the war, the armed forces received 85 percent of the nation's production, which amounted to 231 billion units in 1943. With the implementation of successful mass-production techniques, 1,633 billion units were produced in 1944 and 7,952 billion units in 1945. Penicillin became the war's "wonder drug," and its remarkable medical effects on infectious disease made World War II different from any previous war. Penicillin is now used all over the world. Thanks to the work of scientists and their staff, together with the Illinois farms and numerous drug companies, the drug saved the lives of hundreds of thousands of war victims during World War II and has continued to shorten illness and save lives every day since. By the early 1950s Pfizer was the largest producer of natural penicillin. By then, however, it was no longer the only wonder drug. The effort to synthesize penicillin during the war marks one of the most intensive undertakings in the history of inorganic chemistry. Unlike the natural fermentation process that scientists successfully used to produce penicillin, the effort to produce a synthetic penicillin failed. It is a story of frustration, bewildering complexities involving the beta-lactam structure, and personal triumph, leading ultimately to the development of a family of antibiotics in the 1950s and 1960s. researcher without the pressures of wartime, Sheehan made the decision in 1948 to direct his research efforts to the penicillin puzzle. For the next ten years he was without competitors, as most other organic chemists had concluded that penicillin's synthesis was too difficult or unnecessary. In 1957 Sheehan synthesized penicillin and first used the term antibiotic. Research continues today in the penicillin and related beta-lactam antibiotics.